This summer I have the great pleasure of taking a group of CTSS students to Portugal to study cross-cultural approaches to criminal justice, security and terrorism at the University of Minho, Braga. For me, studying abroad is a unique environment; it is shorter, and more intense. Far more independence is afforded (and indeed expected in return). “Learning” is not so much about passive reception of information but about actively seeking out information. Students’ are required to reflect on everything they see and experience (“what do these differences between Portuguese and American culture mean?” “How can we learn from this?”). As such this trip is a combination of classroom based learning and more applied experiences (in week 2 we are able to tour a local prison, while in week 3 we are going to be visiting the U.S. Embassy in Lisbon to discuss our experiences and have a briefing from the United States Ambassador to Portugal (Hon Robert Sherman). While here the students will also be collecting and analyzing data on a (security related) subject of their choice. As part of this trip we are asking students to write regular blog posts to allow them to reflect on their experiences as well as to communicate what they have learnt to the outside world. Below are a few of these blogs for the first week of our trip; they reflect on the students’ early experiences and their perceptions of the, very unique, São João Cultural Festival which we were able to attend just after we landed in Portugal. Never have I felt more accepted or had a greater sense of belonging than in Portugal. These past few days here have been some of the best days of my life, and the things I have experienced have been unimaginable. I know my time here will fly by so I’m trying to make the most of what little time I do have. This past weekend, we had the opportunity to go to the beach and swim in the freezing water. I got whipped by the sand and burned by the sun but still had an incredible time. A few of us bought a soccer ball at a nearby shop and started playing at some nets set up at the beach. Eventually, some Portuguese men on the beach asked to join us and we played a pickup soccer game. Our skills were no match for them and they demolished us. Even though only a few spoke English, we all had a grand time filled with laughter. The following day, we hiked to the top of Bom Jesus do Monte, a religious sanctuary that overlooks the whole city. The sun beat down on us as we made our way up to the top and we climbed over 70 flights of stairs to get there. From the top, the view was stunning, as you can see for miles in all different directions. Exploring on top of the hill, we found caves, gardens, old buildings, and even tried to rent a boat to explore a pond. Later that night, a local Portuguese student, José, invited us over to his place for a home cooked meal. A group of us piled into his small flat and ate delicious pasta in a meat sauce. We took up his kitchen table, his living room, his balcony, wherever we could find a spot to sit, and we all laughed, told stories, and enjoyed each other’s company. At one point, José began to cry because never in his life did he imagine having a group of Americans in his home. While I do miss my comfort foods and my dogs, I feel so fortunate to be here, experiencing this culture. I cannot wait to see what next week holds for me and I can only hope that it is as memorable as this past week. Portugal has always been on my top 5 list of places that I wanted to go. So, I jumped at the opportunity to not only travel to Portugal but also combine it with a classroom learning environment. So far, this trip has been a big shock. I was under an extremely false impression that more people would speak English and that it would be a lot easier to get around and communicate. This was not reality. Thank goodness we have an amazing group of students from the University of Minho showing us around and helping us communicate our needs to the local people of Braga. So far, the culture here is amazing. 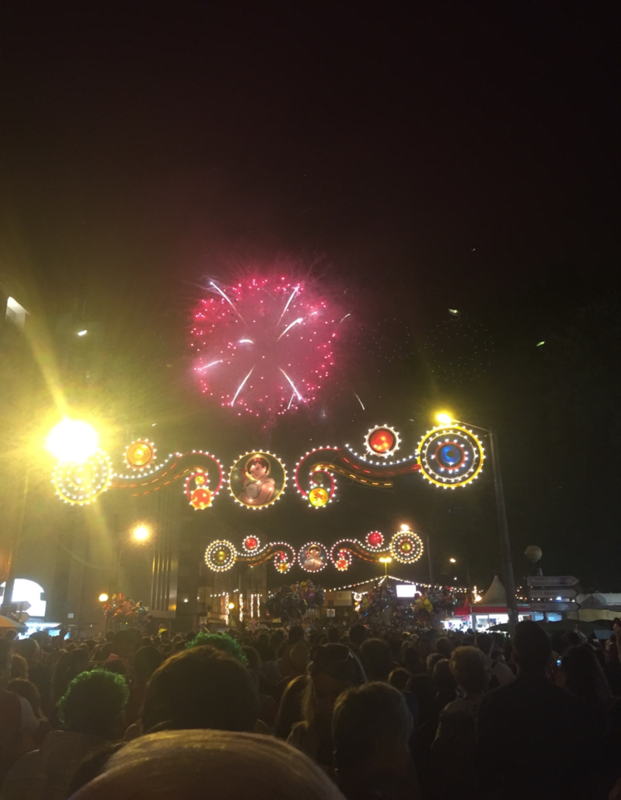 As a group, we had the opportunity to attend Braga’s, São João festival which celebrates the Saint for that area. During this festival, there was a lot of food from local places, all of which is amazing! Also, a big tradition that the people of Braga participate in is tapping people on the head with a toy hammer that makes noises. The people also send off heat balloons with wishes that float into the sky. Though everyone is supposed to be hitting everyone else on the head, every time someone would do it to me, I felt the need to thank them for involving me in their traditions and being so nice! Before the festival, we also had the opportunity to tour an old city nearby. In this city, we got to visit two castles and enjoy an amazing view from them. We also got to see them preparing for a big fair that they had going on over the next few days. This fair is a reenactment of a medieval marketplace. Their costumes and set up were so authentic and fit in perfectly with the city. I feel as though fairs in the US become more of an eyesore as opposed to a being an extension of the cities’ histories. All in all, it is only day two of being in Portugal and I’m already in love with it. This has been an eye opening, once in a lifetime experience that I’m so excited I had the opportunity to enjoy. Coming into this experience, I did not know what to expect. I was nervous being in a country I did not know well and where I did not speak the native language. So far, everyone has been very nice and welcoming, especially the Portuguese students that are helping us. They’re constantly offering us tips, suggestions, and doing anything they can to make our experience as great as it can be. It was very interesting talking with them about different topics within criminal justice and seeing how the United States and Portugal/Europe differ in those aspects. 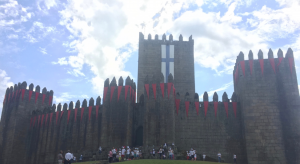 The tours of Guimaraes and Braga were both incredible. Both cities have so much culture and history. It was amazing seeing the castles and the many churches, cathedrals, and chapels (pictures 1-3). In the United States, we usually do not get to see these types of buildings and structures, so getting to see them in person was so surreal. Everywhere we turned, there was always something fascinating to see. The Festa de São João, or the festival of St. John the Baptist, was one of the best experiences I’ve had. At first, it was a little strange seeing people walk around and hitting each other on the head with plastic squeaky hammers. As the night went on, it became more and more normal. The streets of central Braga were filled with thousands of people, endless places to get food and desserts, and everyone was just having an amazing time (picture 4). People of all ages were there, from babies and toddlers to grandparents; everyone joined in on the festivities. At the end of the night, it was all capped off with fireworks (picture 5). In our groups, we talked about what some of the differences were between Portugal and the United States that we saw from our first few days. We realized that Portuguese people do not talk much about terrorism; they have much stricter laws on weapons; and, we did not really see many police officers at the festival the night before. It seems like they try not to let the media talk about terrorism, because, that way, the terrorists cannot get national attention, at least not in Portugal. The United States will always be able to learn a thing or two from other countries, but the United States can also teach a few things.